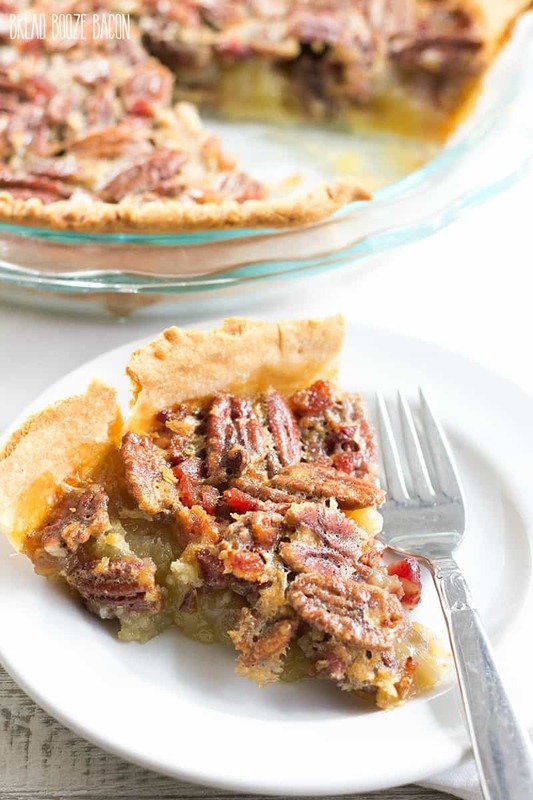 This Bourbon Bacon Pecan Pie is absolute bliss! A boozy, sweet, and salty dessert any good Southerner will adore! It’s the perfect treat to serve for the holidays. 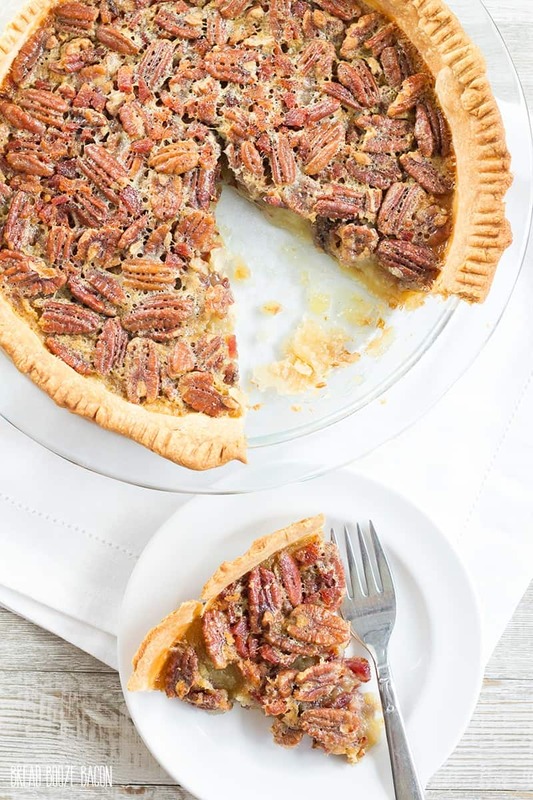 Can you believe I had never eaten Pecan Pie before this recipe? Seriously. Which is kind of sacrilegious consider my grandma’s from Tennessee. But today we rectify that. So grab your favorite bacon freaks and get ready to dig into a dessert that is going to blow you away! If I had known how freaking good this Bourbon Bacon Pecan Pie was going to be I would have made it years ago! 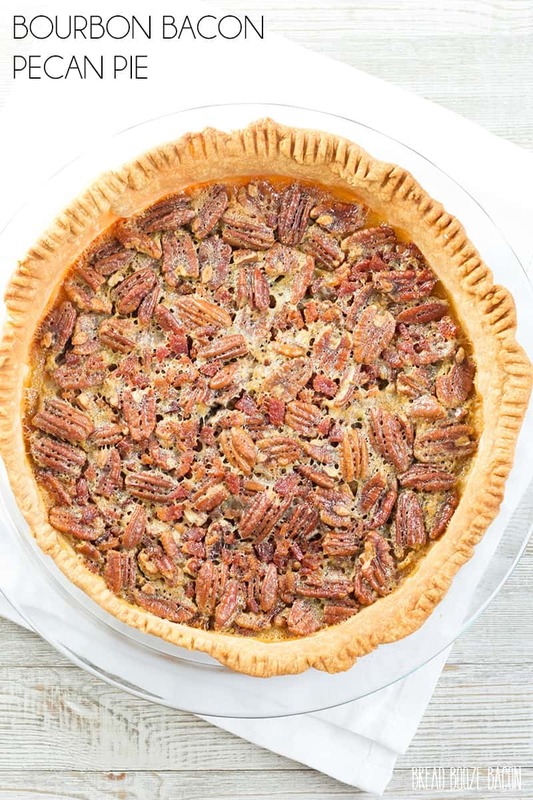 This whole thing starts off with my family’s perfect pie crust recipe and then gets filled with a bourbon laced sugar & egg mixture, pecans, and lots of crispy bacon. The result is so damn good you guys. The butter, vanilla, and bourbon together in the filling is sweet and rich. The bacon gives these great salty pops to balance things out. And the pecans soften up just enough to make them melt in your mouth with the rest of the pie. I’m convinced this pie could bring world peace. This being my first time making Pecan Pie I scoured through recipe after recipe for cooking times. I found a lot of schools of thought about it and ended up doing a higher temp browning time, and then a lower temp time to set the filling. That being said, my filling was still on the soft side. It was semi-set, not oozing out or anything, but the slices didn’t have the filling totally stacked up. Luckily I found some great tips for pecan pie troubleshooting. If this is your first go round with Bourbon Pecan Pie too or if you’re an old pro looking for some tips, this post is great. I made the pie again and everything went swimmingly. I hope you’ll make this pie ASAP. It’ll blow your mind! Since your mouth is probably watering for all kinds of delicious bacon recipes by now, I’m not about to leave you hangin’. Today’s the second week of Bacon Month and I have a slew of recipes to get you the bacon fix you’re craving! 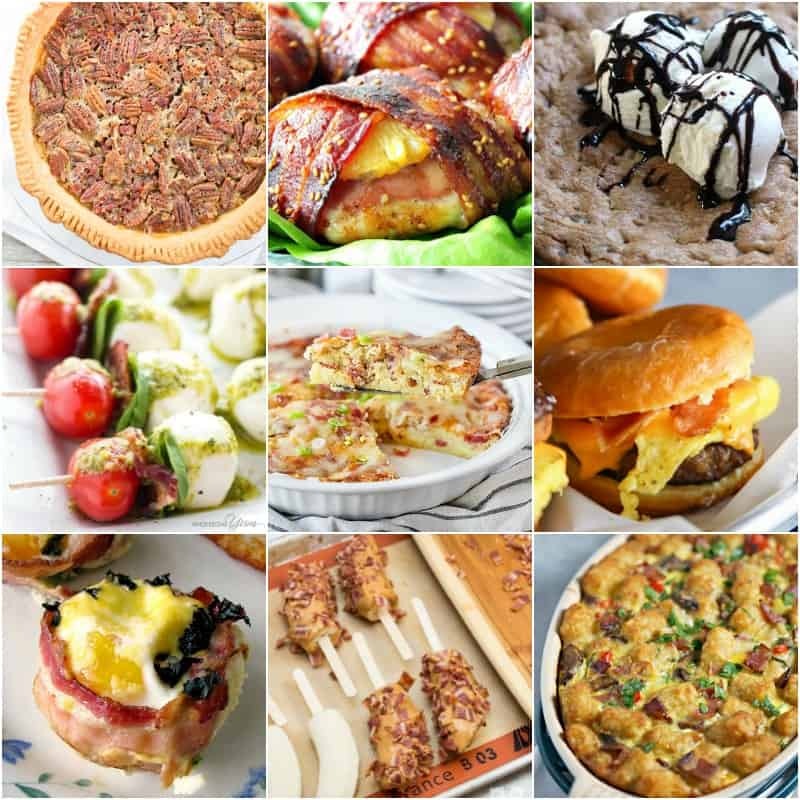 This week’s recipes are below, but you can see last week’s recipes or all the past Bacon Month recipes by clicking these links as well. 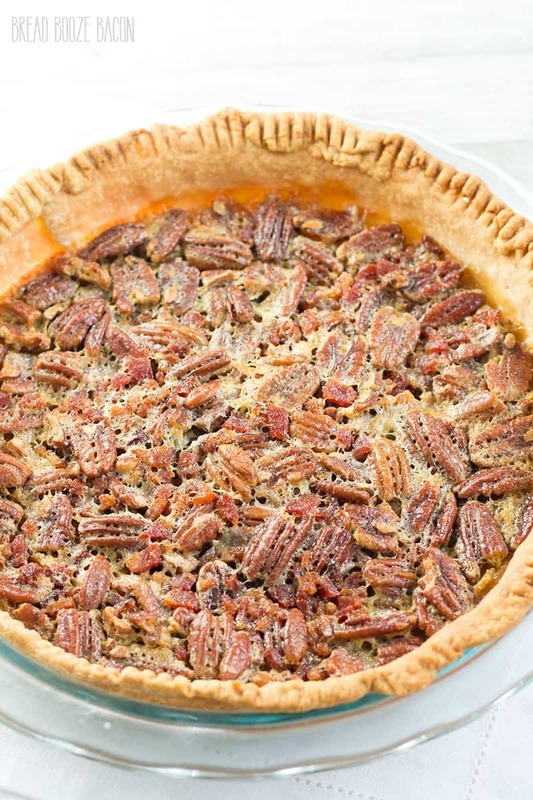 This Bourbon Bacon Pecan Pie is absolute bliss! 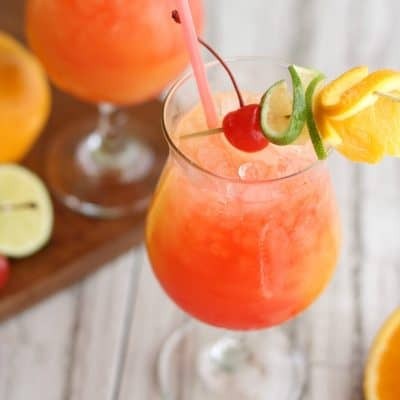 A boozy, sweet, and salty dessert any good Southerner will adore! It's the perfect treat to serve for the holidays. Line a pie plate with the uncooked pie crust. Carefully fit the crust to the pan and trim off any excess crust hanging over the end. Decorate the edge of the pie if desired. Use a fork to poke holes in the bottom and sides of the crust. Par-bake the crust fro 8 minutes. Remove from the oven and set aside. In a medium mixing bowl, whisk together the sugar, eggs, and corn syrup until smooth. Add the melted butter, bourbon, vanilla, and salt. Whisk until combined and smooth. Place half of the pecans into the bottom of the pie crust. Sprinkle 1/2 of the bacon over the nuts. Repeat the nut & bacon layers. Pour the pie filling into the crust. Bake for 45 to 55 minutes. If the crust begins to brown too much, place some foil or a pie crust protector over the crust. The pie is done when a knife inserted in the center comes out almost clean (a little goo is fine). Remove from the oven and allow to cool to room temperature. The pie will set up a little more as it cools. Serve as is or with a scoop of vanilla ice cream on top. To save prep time, I usually cook the bacon in the oven while par-baking the crust and while I mix up the filling. I love bacon in desserts! It’s that sweet/salty thing that gets me every time! Would you believe I’ve never had Pecan Pie?! This looks incredible though. The top of this pie looks so perfectly crispy! I haven’t have pecan pie in ages- I need to make this, I bet the bourbon is the best possible addition! I could SERIOUSLY go for a slice (OK, let’s be real… 2 slices) of this pie right now! Love that sweet-salty action!